Happy New Year all! I’ve spent almost 2 months without taking a single photograph but have resolved to change this in 2015! First up, an unusual bloom for this of the year in England. These flowers are those of the Kalanchoe genus, succulent tropical species from the old world which decided to bloom in January here in Cambridge (I suppose that being on a window sill in the bathroom helped!). ISO 200, f/22, 21 second exposure. Click on the photo for a larger version on Flickr. Photographed using a Nikon D7000 Camera with a Sigma 105mm f/2.8 lens. ISO 200, f/22, 21 second exposure using a remote shutter release cable. Post-processed in Adobe Lightroom 5.7. 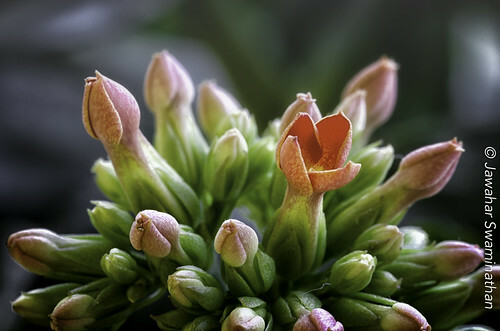 Posted on January 11, 2015 Categories MacroTags Adobe Photoshop Lightroom, Cambridge, Cambridgeshire, Flora and Fauna, Flower, Kalanchoe, Macrophotography, Nature, Nikon D7000, Winter7 Comments on Winter blossom!